Clipping, also known as saturation, is a common phenomenon leading to sometimes seriously distorted audio recordings. Declipping consists in performing the inverse process, to restore saturated audio recordings and improve their quality. A-SPADE is a declipping algorithm developed by PANAMA (a joint project-team between Inria and CNRS). It is based on on the expression of declipping as a linear inverse problem and the use of analysis sparse regularization in the time-frequency domain. To the best of our knowledge SPADE achieves state-of-the-art declipping quality. For more information, please visit this website: spade.inria.fr. You can also contact us through this form. Before using the software, have a look at this documentation and at the “Demo” tab which provides some input examples (parameters and audio files) that can be used with A-SPADE. The “Demo” tab also provides output examples. A-SPADE will give you the desaturated version of your input signal as a .wav file. Supported input formats are .wav, .mp3, .mp4, .m4a, .ogg, .flac. Long multi-channel files are eligible for declipping. This online application, as a trial version of the software with limited parameters options, will process only the first 2 channels and the first 30 seconds of your input audio files. If you are interested in processing longer excerpts or more than stereophonic recordings, please contact us. Upload your audio file(s) with the “+ Upload File” button. an optional clean reference (Warning: If you have a clean reference make sure that it is recorded with the same sampling rate as the saturated one, that it has the same channel number and the same duration but a different name). In the “Version” pop-up menu, check that the latest software version is selected. -p preset: One preset allowing some tuning of the algorithm: “HighQuality”, “Average” (default value), “Fastest”; The following example explains how to fill the "Parameters" section in order to process the clipped file named "clipped.wav" from an original recording named "original.wav" with the "Fastest" preset. Start your declipping by clicking on the “Run this job” button. Once your job is finished you should be able to listen to the result and save your declipped signal in a file named “Declipped_<name of your input file>.wav”. As in the screenshot below, if you provided a reference signal you will get the SDR (Signal to Distortion Ration in dB) measurements before and after processing in the “allgo.log” file. Finally, you will find, for each channel, an overview of the ratio of clipped samples for the computed clipping threshold. 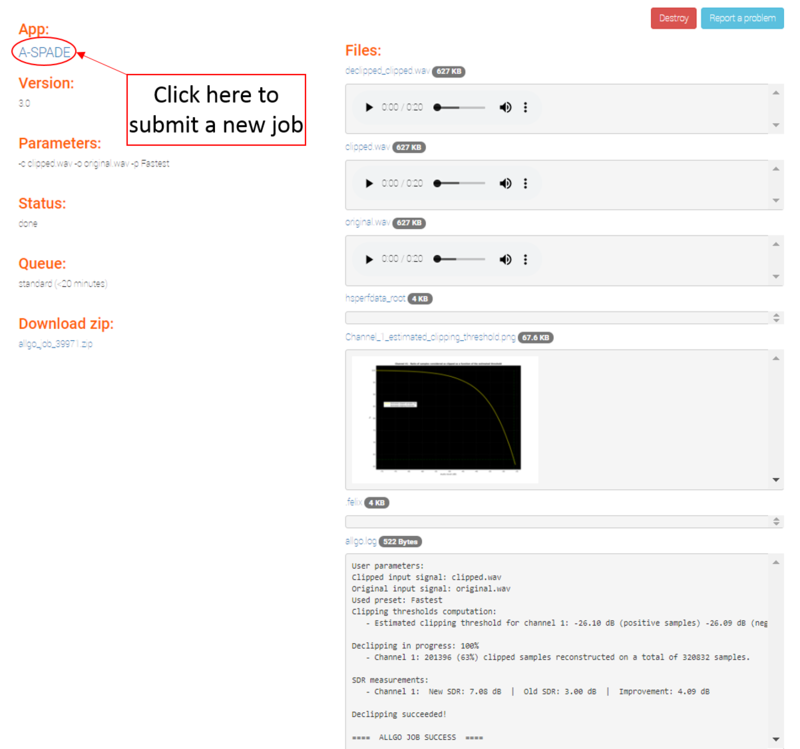 To try the application with other files and submit a new job, click on the “A-SPADE” link in the left top corner of the result page as shown below. Once the job is running, it could take from a few seconds to a few minutes to get the declipped version of your file. S. Kitic, N. Bertin and R.Gribonval. 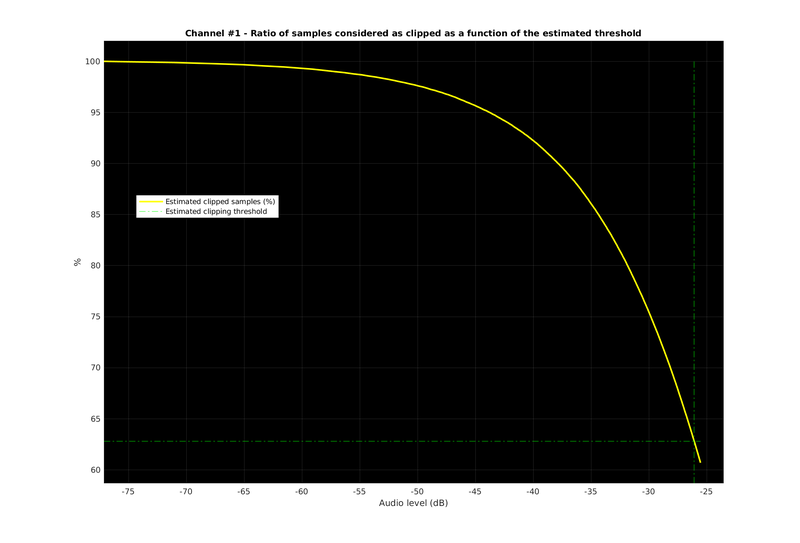 Sparsity and cosparsity for audio declipping: a flexible non-convex approach. In Latent Variable Analysis and Signal Separation, Liberec, 2015. The examples shown in the "Demo" section are from the RWC Jazz Database: M. Goto, H. Hashiguchi, T. Nishimura, and R. Oka: RWC Music Database: Popular, Classical, and Jazz Music Databases In Proceedings of the 3rd International Conference on Music Information Retrieval (ISMIR 2002), 2002. - Channel 1: 201396 (63%) clipped samples reconstructed on a total of 320832 samples. 06/08/2018 : Version 3.0, New algorithm to compute clipped thresholds. Processing time reduction.